Researching. This includes using a card catalog — yes those still exist! — to find materials that need to be digitized. This may not seem like a lot of fun, but I liken it to a treasure hunt. Sometimes Melissa, the Rights and Reproductions Coordinator, and I spend a long time tracking down a specific document, letter, map, or photograph. We’re both fairly short and we often have to ask for help reaching an item because even a ladder isn’t tall enough to help us. However, the feeling of satisfaction you get when you find an item after a long hunt? Yeah, it’s good. Digitizing. My friends often ask me if I get to read historic documents while I’m digitizing. 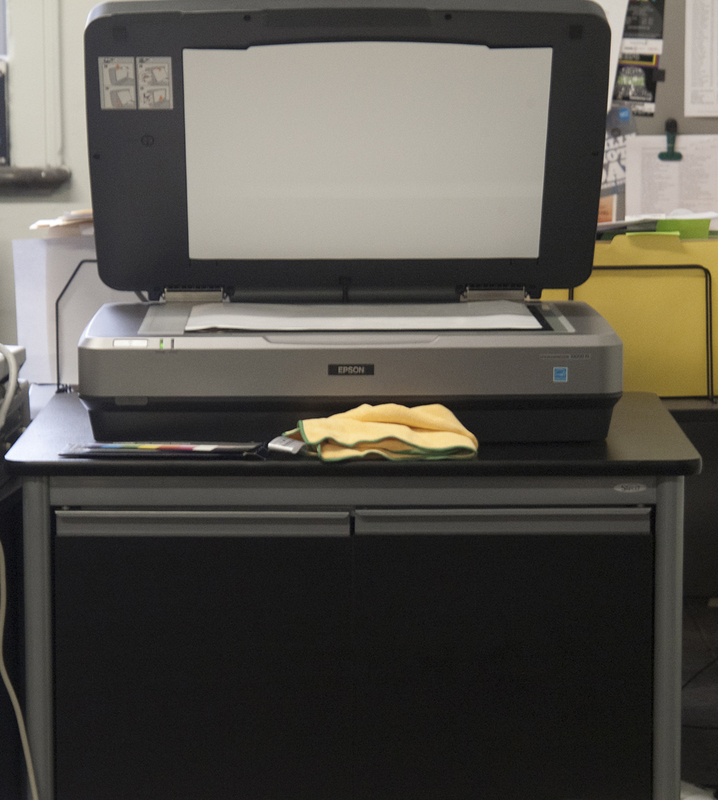 I try to, but I often get in zone of scanning and it doesn’t always happen. Instead, I read snippets of someone’s life, which I liken to watching a reality show on an inconsistent basis. 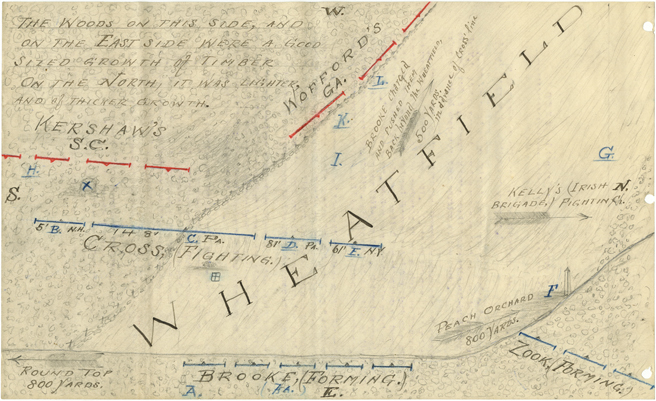 The most interesting document that I have digitized so far is a diary of a soldier in the 29th Infantry during the Civil War. His diary was equal parts History Channel and Oregon Trail, complete with every type of illness you can imagine. One of the more exciting aspects of digitizing is that I get to use Photoshop, which I love playing around with because it has so many unique features. Metadata-ing. Can I make that a verb? I have a love/hate relationship with metadata. Fun? Yes. Tedious? Yes. Of course, I know it needs to get done because it helps you find what you are looking for in the Digital Library. If you haven’t visited the Digital Library yet, there is no better time to start. Launched earlier this month, it contains thousands of images from our collections that focus on Philadelphia and Pennsylvania history. For the past four months, I have been going through our digital access management system, affectionately called the DAMS, to fix typos and other stay marks that would prevent you from finding what you are looking for. 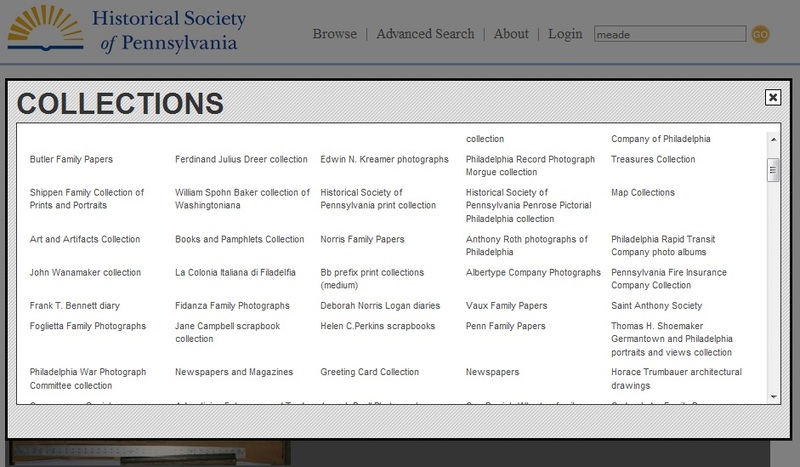 In my last blog post I wrote about HSP’s ongoing wrestling match with its card catalog and the difficulties in converting legacy systems and data. One thing I failed to mention is the importance of designing any information system with future data migration in mind. This is of particular importance for an archival institution, like HSP, which has the end goal of maintaining records in perpetuity. The graphics shelf list currently going through conversion survived as a viable access and retrieval system at HSP for more than a century. That system’s time has finally come, however, and for a variety of reasons (most of which could not have been predicted in the age of steam) we must spend a large amount of effort to bring its data into the digital realm. Surely it will be more simple in the future to migrate systems which are already digital? Computer systems currently have a very brief lifetime. 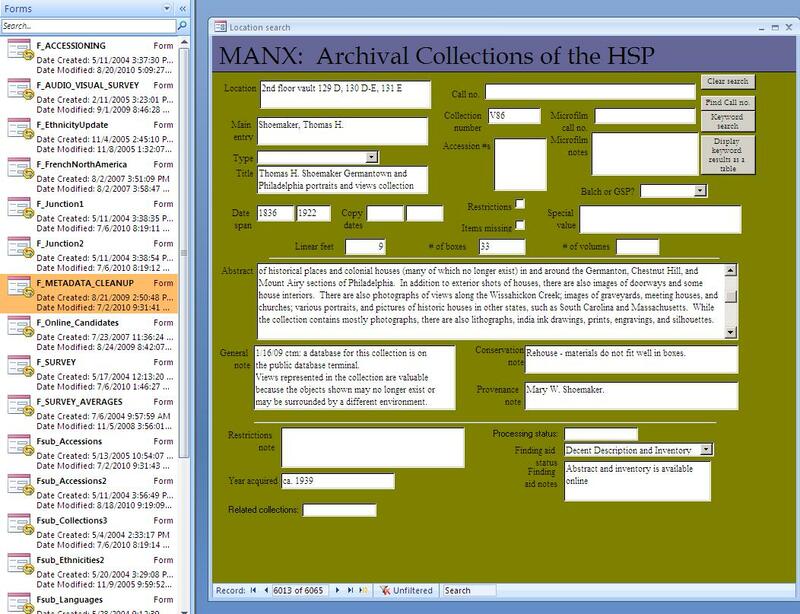 MANX, the manuscript management system at HSP built from a Microsoft Access database, has been in use for less than a decade and already needs to be replaced. Hardly the same life expectancy as the card catalog. Even so, MANX can be considered a dinosaur in the tech world where it is recommended that most systems be cycled out every 3 to 5 years. What can we do to prevent future difficulties in managing and migrating data from one system to the next? Since we cannot predict what the future will hold, the best thing we can do is collaborate and standardize. We are moving ahead in this spirit at HSP by adopting the Archivists’ Toolkit open source software (AT). Though I am currently having some difficulties in getting data from MANX into AT, due to the nature of moving from one data model to another, I believe that once imported the data will be easier to migrate into future systems. AT has community support, is becoming more widely adopted, and has a data model built on the DACS rules. All of this translates into support from peers when it is time to move to something new, as well as widely adopted content standard in which to frame your information. 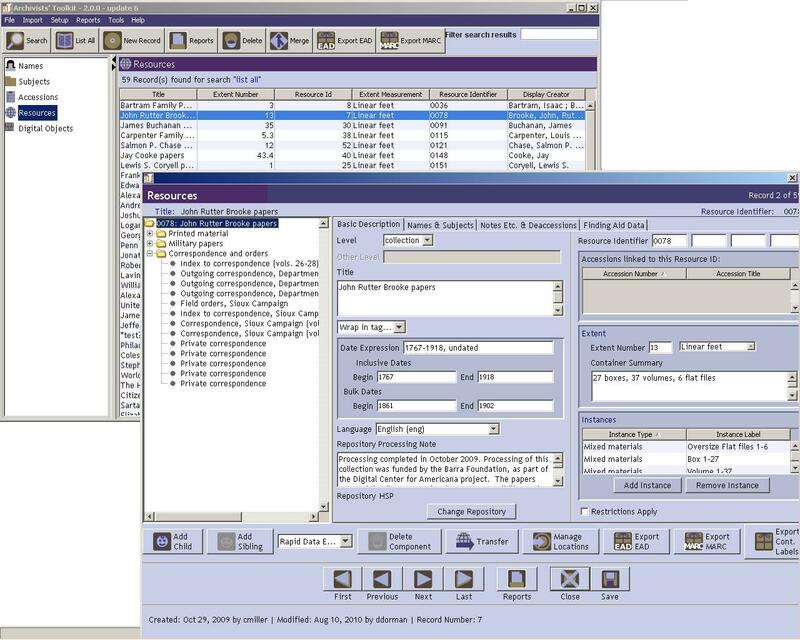 Simply put, you no longer need to be alone when designing an archives system, and there will be many others in a proverbial migration boat built with the same structure come a few years time. All of this provides an incentive in the archival profession to find solutions to future migration issues together, hopefully making the jump from one system to the next a far easier task than what many of us face today. There is no guarantee that community driven and profession specific software will solve all of our migration issues. There are many who are skeptical of open source software and fear adopting a system that relies on development and support by their peers. While there are certain risks involved, I believe that building these systems together will in the long run make things easier for us all. I only hope these efforts allow the systems librarians who succeed me in centuries to come find their migration tasks less challenging than mine. 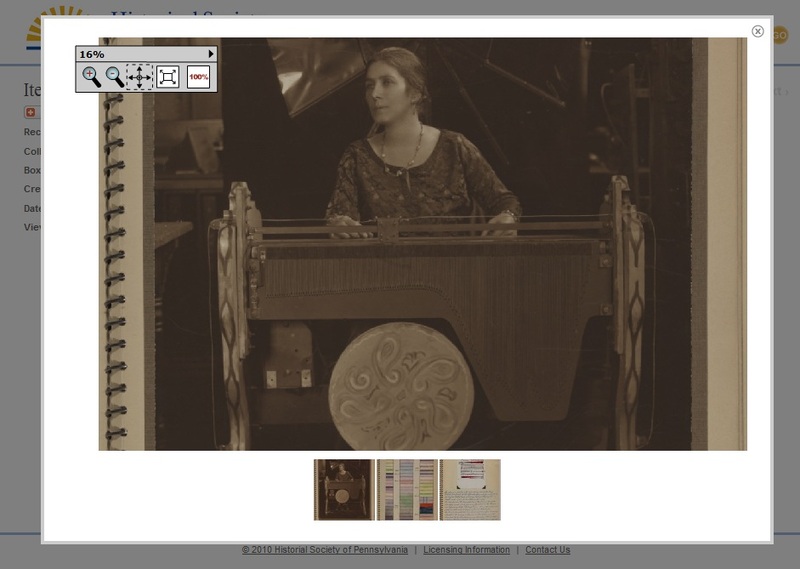 My role in the Digital Center for Americana Project is to scan items and enter metadata for these scans. 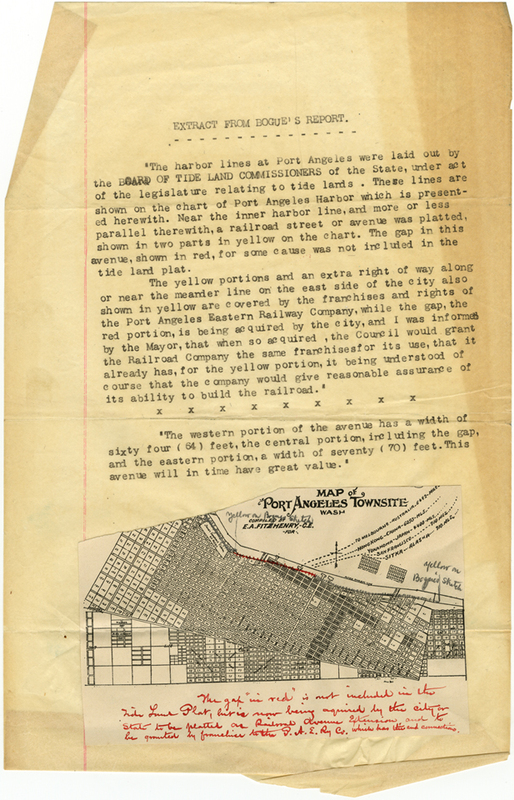 This includes information on where the item is located in the building, who created it, what it is, and descriptive notes. In addition I enter the technical particulars of the scan itself, such as dpi and pixel dimensions. Early on in the project a decision was made to create metadata records on the box level. That way we can follow through on the More Product, Less Process concept all the way to digitization. This has contributed to a current work flow that cuts down on repetitive data entry, and reduces the opportunity for errors. At the beginning of the process the project archivist picks some items, or signposts, that are good representations of that particular section of the series and flags them for digitization. When I start scanning I enter the metadata for the group. Each scan is named with three sets of numbers. The first is the collection number, the second is the sequence of metadata records within the collection, and the last is the individual item number. So I only have to go back to the metadata record when I’ve finished scanning all of the signposts in a box, to enter the last scan number in the series. The project archivist will then contribute further edits to the descriptive notes, as needed. 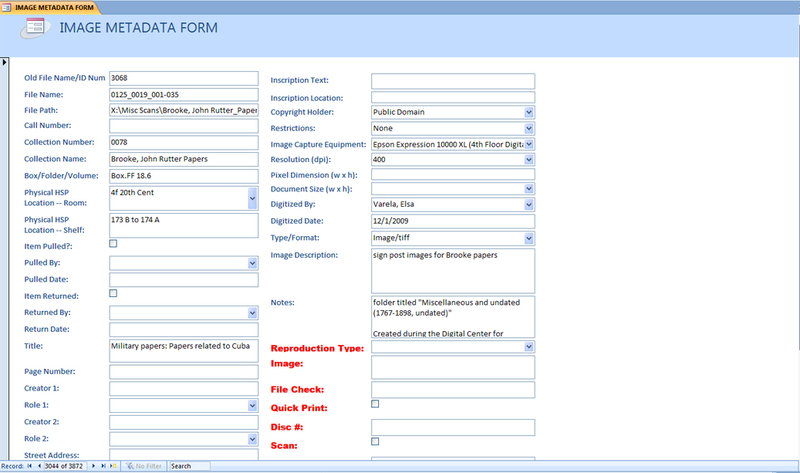 In general the data entry is done fairly quickly, for a manual entry process. Below is a sampling of scans that are grouped together in the one metadata record seen above. They are from the John Rutter Brooke papers (you can read more about the General’s collection in other posts here). All happen to come from a folder labeled “miscellaneous,” and as you can see they cover the gamut. 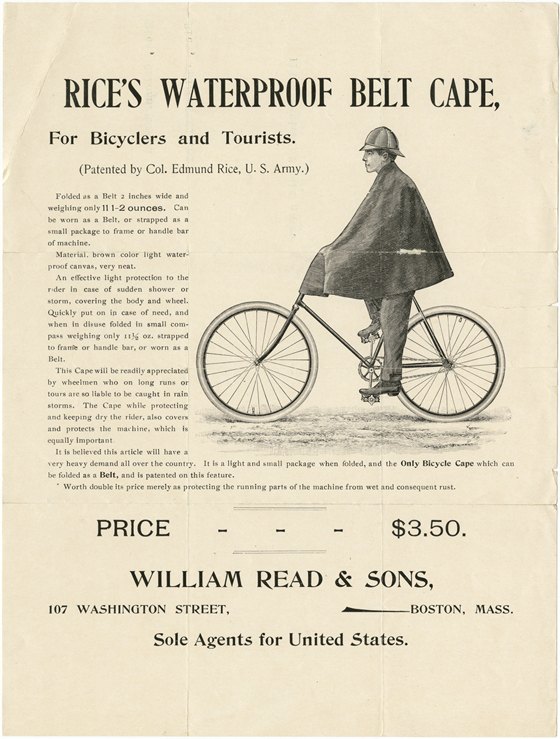 Included are a recipe for tooth powder, an advertisement for a waterproof belt cape, an excerpt from a military report, and a sketch of a military advance. 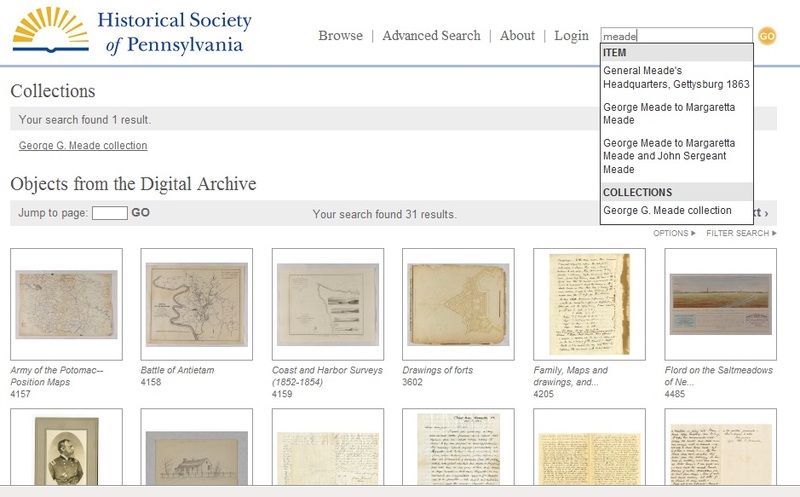 If you go to the section entitled About Us at our website, you’ll see that the Historical Society of Pennsylvania has over 19 million manuscripts and graphic items. HSP was founded in 1824 and as you can imagine, we have been collecting and acquiring materials on a continued basis since. In order to find all these items when we need them, we have to describe them in detail and make records with that information. The more information we have to describe an item, the greater the chances of researchers or staff finding it. 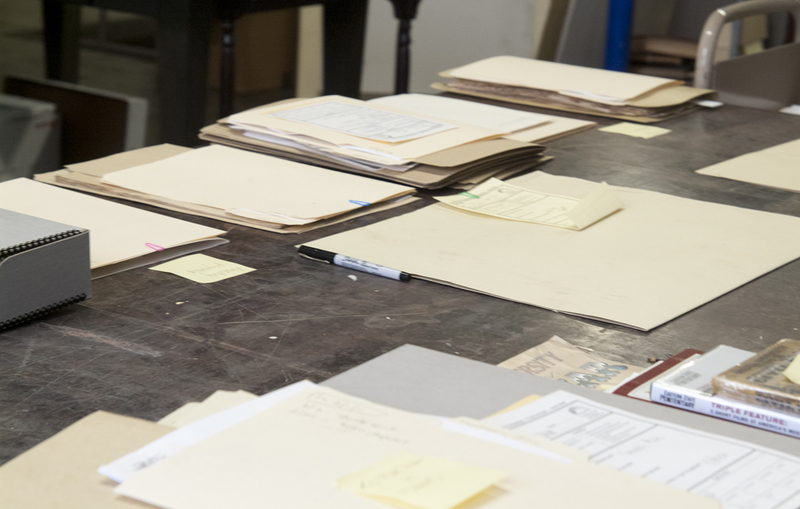 To describe items in a structured way, we rely on DACS: A Content Standard, a set of rules adopted by the Society of American Archives (SAA) for describing archives, personal papers, and manuscript collections. Taking into consideration standards and rules already adopted by the international archival community, this group of precepts establishes fundamental axioms for every record we create: all records must have an identifying number, all records must have a creator, all records must have a title, date span, extent, declaration of languages, declaration of restrictions of access, etc. The number and nature of precepts depends on the level of description desired: single or multi level, minimum, optimum, or added value. The language used to describe the items is also subject to certain rules, in this case they could be DACS-based, or AACR2, or Library of Congress Authority Files when we must ascertain the correct name for a corporation or we need to disambiguate a person’s name. Having lots of records created before SAA’s adoption of DACS, here at HSP we decided that our records should be DACS compliant in order to give uniformity to our holdings. For the last couple of months (and continuing through the next year) we have been updating our archival and bibliographic records so they can be as clean and as clear and as informative as possible. To go about this task, Matthew Lyons (Director of Archives and Collections) and I developed both an Access Table Form to “clean up” each record, and a set of “solutions” to each possible problem (i.e. “If a record has a Collection Number AND a Call Number, make sure it is the number for a no-longer-used artificial collection. Make a note “Collection Number needed” in the Metadata Comments”). Also, in this Metadata Clean-up Form we can register the reasoning behind our decisions, making clear why and according to which set of rules our final determinations were based upon. Sometimes it could seem as if there is no need to be so specific when describing papers but, believe me, there is a difference between Anonymous and Unknown, or the way a computer reads the word and vs. an ampersand. Updating our records to make them DACS compliant makes our collections more accessible to researchers while establishing part of HSP’s policy on archival description for the future.